This project has been funded by the DFG within the CRC 1052 from 2013 to 2016. The increasing incidence of diseases associated with energy metabolism, such as obesity, diabetes and coronary heart disease may be associated with recent changes in lifestyle. It has been hypothesized that some of the genetic causes of such diseases have their origin in adaptation to past environments. 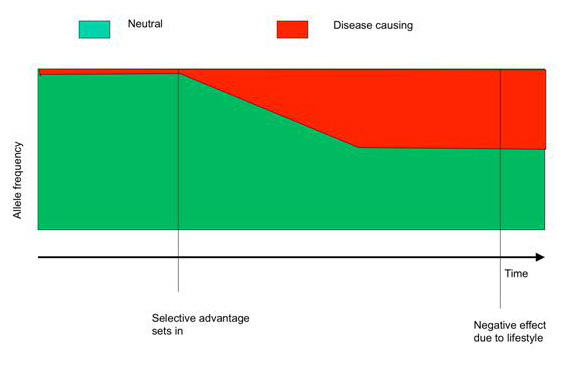 Hypotheses about the origins of some modern diseases, such as diabetes and obesity, suggest that previously advantageous phenotypes currently lead to disease susceptibility in modern environments – the so-called “Thrifty Gene” hypothesis. Scans for recent positive selection and subsequent systematic analysis of the genomic regions identified may therefore offer insight into the genetic basis for these disorders. Comparative genome sequence analyses can also be used to identify positions where non-human primates carry known human Mendelian disease variants. 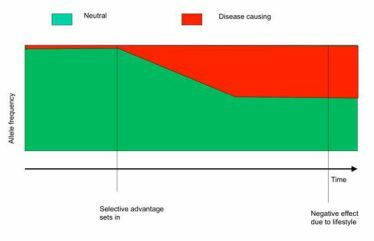 When the Mendelian variant is not known to be associated with the disease in the non-human primate, compensatory variants may have been lost in humans, or the disease arises due to differences in environmental factors and life expectancies. For some, the recent and specific loss of compensatory variant may be explained by positive selection. Figure 2. Allele frequencies in modern populations provide a genetic signature of a predisposition to obesity. Quach H, Rotival M, Pothlichet J, Loh YE, Dannemann M, Zidane N, Laval G, Patin E, Harmant C, Lopez M, Deschamps M, Naffakh N, Duffy D, Coen A, Leroux-Roels G, Clément F, Boland A, Deleuze JF, Kelso J, Albert ML, Quintana-Murci L. Genetic Adaptation and Neandertal Admixture Shaped the Immune System of Human Populations. Cell. 2016;167:643-656. Welker F, Hajdinjak M, Talamo S, Jaouen K, Dannemann M, David F, Julien M, Meyer M, Kelso J, Barnes I, Brace S, Kamminga P, Fischer R, Kessler BM, Stewart JR, Pääbo S, Collins MJ, Hublin JJ. Palaeoproteomic evidence identifies archaic hominins associated with the Chatelperronian at the Grotte du Renne. Proc Natl Acad Sci U S A. 2016;113:11162-7. Fu Q, Posth C, Hajdinjak M, Petr M, Mallick S, Fernandes D, Furtwängler A, Haak W, Meyer M, Mittnik A, Nickel B, Peltzer A, Rohland N, Slon V, Talamo S, Lazaridis I, Lipson M, Mathieson I, Schiffels S, Skoglund P, Derevianko AP, Drozdov N, Slavinsky V, Tsybankov A, Cremonesi RG, Mallegni F, Gely B, Vacca E, Morales MR, Straus LG, Neugebauer-Maresch C, Teschler-Nicola M, Constantin S, Moldovan OT, Benazzi S, Peresani M, Coppola D, Lari M, Ricci S, Ronchitelli A, Valentin F, Thevenet C, Wehrberger K, Grigorescu D, Rougier H, Crevecoeur I, Flas D, Semal P, Mannino MA, Cupillard C, Bocherens H, Conard NJ, Harvati K, Moiseyev V, Drucker DG, Svoboda J, Richards MP, Caramelli D, Pinhasi R,Kelso J, Patterson N, Krause J, Pääbo S, Reich D. The genetic history of Ice Age Europe. Nature. 2016;534:200-5. Carmody RN, Dannemann M, Briggs AW, Nickel B, Groopmann EE, Wrangham RW, Kelso J. Genetic evidence of human adaption to a cooked diet. Genome Biol Evol. 2016;8:1091-103. Vernot B, Tucci S, Kelso J, Schraiber JG, Wolf AB, Gittelman RM, Dannemann M, Grote S, McCoy RC, Norton H, Scheinfeldt LB, Merriwether DA, Koki G, Friedlaender JS, Wakefield J, Pääbo S, Akey JM. Excavating Neandertal and Denisovan DNA from the genomes of Melanesian individuals. Science. 2016;352:235-9. Weiß CL, Dannemann M, Prüfer K, Burbano HA. Contesting the presence of wheat in the British Isles 8,000 years ago by assessing ancient DNA authenticity from low-coverage data. Elife. 2015;4. Dannemann M, Andres AM, Kelso J. Introgression of Neandertal- and Denisovan-like haplotypes contributesto adaptive variation in human toll-like receptors. Am J Hum Genet. 2016;98:22-33. Ronke C, Dannemann M, Halbwax M, Fischer A, Helmschrodt C, Brügel M, André C, Atencia R, Mugisha L, Scholz M, Ceglarek U, Thiery J, Pääbo S, Prüfer K, Kelso J. Lineage-specific changes in biomarkers in great apes and humans. PLoS One. 2015;10:e0134548. Kelso J, Prüfer K. Ancient humans and the origin of modern humans. Curr Opin Gen Dev. 2014;29:133-8. Khrameeva EE, Bozek K, He L, Yan Z, Jiang X, Wei Y, Tang K, Gelfand MS, Prufer K, Kelso J, Paabo S, Giavalisco P, Lachmann M, Khaitovich P. Neanderthal ancestry drives evolution of lipid catabolism in contemporary Europeans. Nat Commun. 2014;5:3584. Burbano HA, Green RE, Maricic T, Lalueza-Fox C, de la Rasilla M, Rosas A, Kelso J, Pollard KS, Lachmann M, Paabo S. Analysis of human accelerated DNA regions using archaic hominin genomes. PLoS One. 2012; 7:e32877. Dannemann M, Nickel B, Lizano E, Burbano HA, Kelso J. Annotation of primate miRNAs by high throughput sequencing of small RNA libraries. BMC Genomics. 2012;13:116. Dannemann M, Prufer K, Lizano E, Nickel B, Burbano HA, Kelso J. Transcription factors are targeted by differentially expressed miRNAs in primates. Genome Biol Evol. 2012;4:552-­64. Green RE, Krause J, Briggs AW, Maricic T, Stenzel U, [...], Kelso J, Lachmann M, Reich D, Pääbo S. A draft sequence of the Neandertal genome. Science. 2010; 328:710-22. Kircher M, Kelso J. High-throughput DNA sequencing-concepts and limitations. Bioessays. 2010; 32: 524. Reich D, Green RE, [...], Hublin JJ, Kelso J, Slatkin M, Pääbo S. Genetic history of an archaic hominin group from Denisova Cave in Siberia. Nature. 2010; 468: 1044-5. Kircher M, Stenzel U, Kelso J. Improved base calling for the Illumina Genome Analyzer using machine learning strategies. Genome Biol. 2009;10:R83. Green RE, Malaspinas AS, Krause J, Briggs AW, Johnson PL, Uhler C, Meyer M, Good JM, Maricic T, Stenzel U, Prufer K, Siebauer M, Burbano HA, Ronan M, Rothberg JM, Egholm M, Rudan P, Brajkovic D, Kucan Z, Gusic I, Wikstrom M, Laakkonen L, Kelso J, Slatkin M, Paabo S. A complete Neandertal mitochondrial genome sequence determined by high-throughput sequencing. Cell. 2008; 134: 416-26. Carninci P, Kasukawa T, Katayama S, Gough J, Frith MC, [...], Kelso J, [...], FANTOM Consortium, RIKEN Genome Exploration Research Group and Genome Science Group (Genome Network Project Core Group. The transcriptional landscape of the mammalian genome. Science. 2005; 309: 1559-63. Tiffin N, Kelso JF, Powell AR, Pan H, Bajic VB, Hide WA. Integration of text- and data-mining using ontologies successfully selects disease gene candidates. Nucleic Acids Res. 2005; 33: 1544-52.